At 9:09 am, BNSF again attempted, but failed this time, to rush a westbound, unit oil train past a rail-line community, in advance of another demonstration. The train crossed over Sand Creek near its lake outlet, on the single-track bridge that BNSF plans to double-track along with construction of the parallel lake bridge. Water protectors at the event stood with banners in the mid-morning light and close proximity to the train that WIRT activists documented with high-resolution photos clearly identifying its “1267” crude oil hazmat placards. They later noticed several alarming components of these tanker cars illustrated in the photos: tangles of snaggable, undercarriage wires and tanker end valves facing each other on adjacent cars and protruding from rectangular, metal bar “shields.” These purportedly safe rail cars looked like an end-to-end, heavy, oil car crash accident waiting to happen. Marching with protest signs visibly close to U.S. Highway 95, the Bonner County residents and three Washington friends waved to the BNSF cops and contracted, Oregon workers, before reaching the lake shore and standing with banners in front of the pile drive crane and the Lake Pend Oreille rail bridge. As new participants arrived, they circled, smudged, prayed, drummed, and sang in ceremony, then reflected on and discussed second rail bridge concerns among themselves and on video. 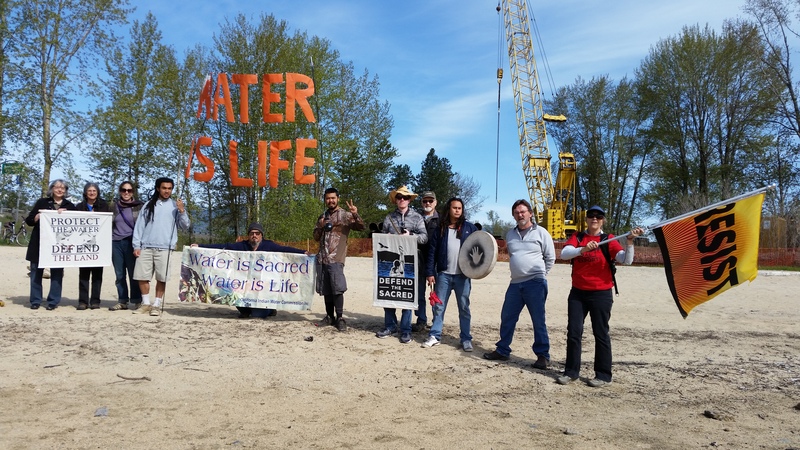 They gradually dispersed and waved goodbye to the railroad crew and police, and gathered for lunch before three visiting Kalispel Nation and Spokane activists departed. During almost three hours of relaxed, invigorating activities, BNSF police maintained a watchful presence as expected, and the uncivil behavior of counter-protesters, anticipated from cyber-bullying opponents who targeted a facebook post about the event with backlash comments, never materialized. As confirmed by existing group knowledge and several government administrators, BNSF has not received any public permits for exploratory pile driving, which it apparently did not accomplish on May 8. Water protectors contributed a good, initial showing of community displeasure with BNSF’s plans for a second, lake, rail bridge. 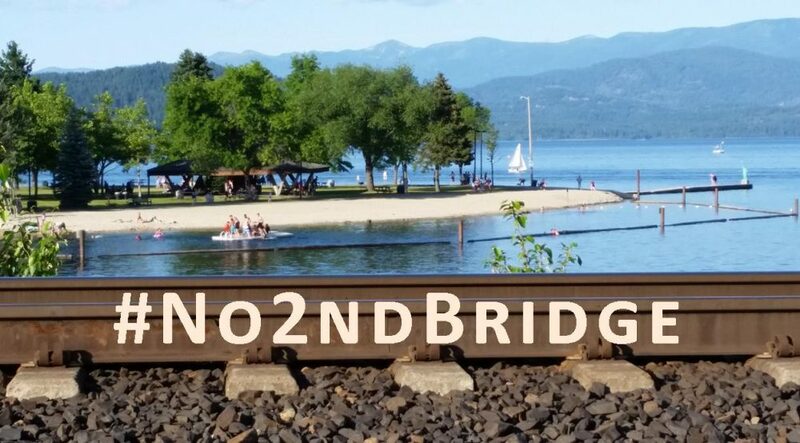 Participants committed to continuing in-depth issue research, contacting government officials and potential allies, sharing pertinent information, considering and forming reasonable arguments, offering remarks at the Sandpoint City Council meeting when BNSF belatedly presents its railroad proposal, encouraging public input to the Army Corps of Engineers permitting process, coordinating direct action workshops and demonstrations, and locally and regionally building ongoing resistance to BNSF-imposed risks and impacts.